(Reuters) - There was no let up in sight for devastating floods across the U.S. Central Plains states that have already killed two people, torn apart homes and businesses and cut off small towns, forecasters said on Sunday. 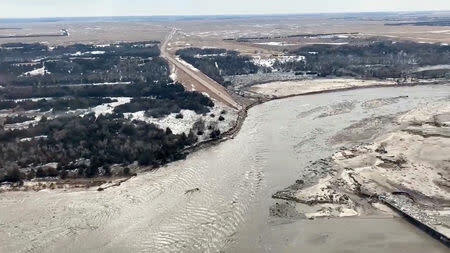 Water levels were expected to rise through the week, according to the National Weather Service, prompting evacuations in communities along the Missouri River on the Nebraska and Iowa border, as well as the Elkhorn and Platte rivers in Nebraska. "We're looking at widespread flooding that continues until at least early next week in the Plains and Midwest region," said meteorologist Marc Chenard with the service's Weather Prediction Center. "The big ones are at record stages right now," Chenard said. "There have been some levy breaks so there are towns that are flooded." Nebraska Governor Pete Ricketts, who declared a statewide emergency last week, wrote on Twitter that he witnessed "unbelievable devastation" when he visited several flooded communities on Saturday. "Getting an update from local officials and public safety personnel in Missouri Valley today. Rain and melting snow have caused severe flooding all across Iowa," Iowa Governor Kim Reynolds said on Sunday on Twitter. Reynolds also issued an emergency proclamation at the outset of the flooding. The massive floods have come in the aftermath of a late-winter storm that dumped snow and rain on the nation's midsection last week. The weather was blamed for two deaths, including one person who died at home after failing to evacuate, and a man swept away while trying to tow a trapped car with his tractor. Some small towns and communities have been cut off by floodwaters while others have seen fresh drinking water become scarce. Meteorologists have referred to the storm, which blew from the Western Rockies to the Central Plains last week, as a "bomb cyclone," a winter hurricane that forms when the barometric pressure drops 24 millibars in 24 hours. "That system brought 1 to 3 inches of rainfall but, on top of that, there was already a deep snowpack over much of the area. So a combination of the rain and snow melt had a large volume of water going pretty quickly into the rivers," Chenard said.